Not to be confused with the American Waltons of Walmart fame, Waltons Department store in Australia was a retail institution during the 70’s and early 80’s, especially at Christmas time. 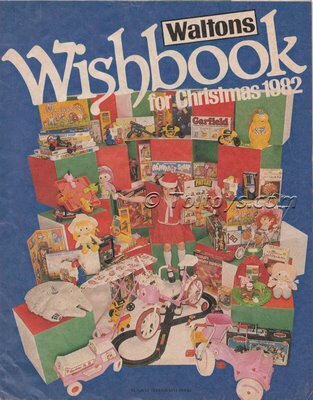 Over many years they offered a Christmas “Wishbook”, an idea most likely borrowed from Sears in the USA, with whom they had a pre-existing relationship. Toltoys.com has managed to obtain a handful of these catalogues and will be presenting highlights from them over the next few months. 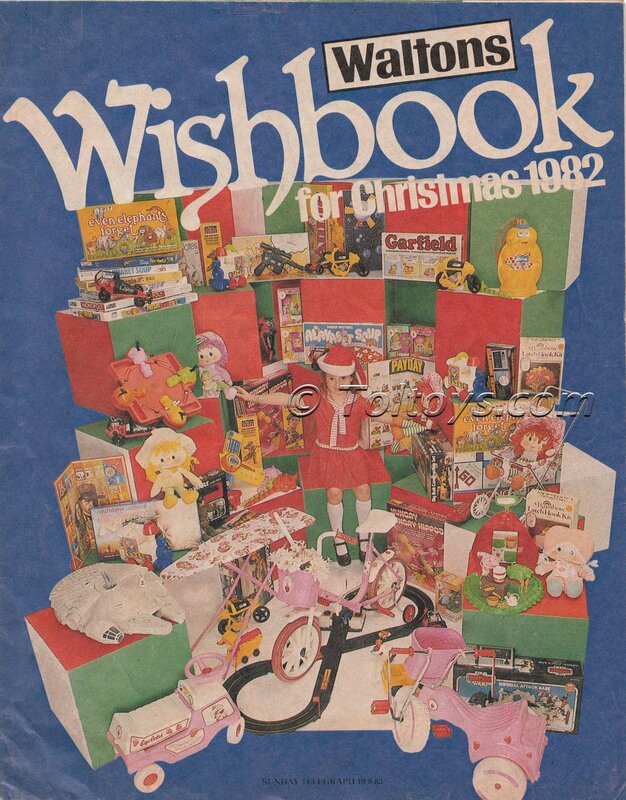 Kicking us off above is the cover of the 1982 Wishbook, which was included as an insert in the September 19th, 1982 edition of Sydney’s Sunday Telegraph newspaper. That’s a lot of vintage toys. I can see Toltoys Action Man, Care Bears and Star Wars amongst the loot, so you’ll get a fair Idea of what might be coming in the next few posts. 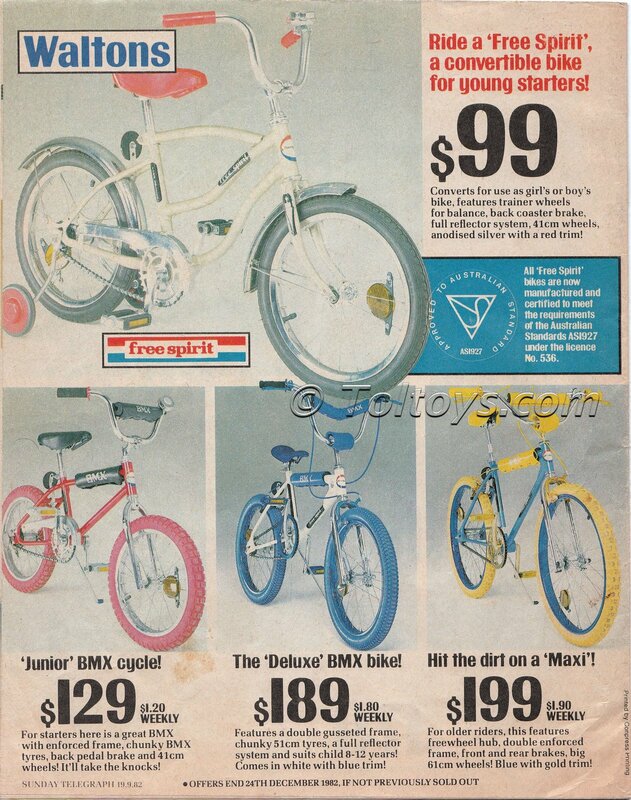 For our first page, how about some vintage Aussie BMX goodness, a selection of Walton’s own “Free Spirit” range of BMX bikes. 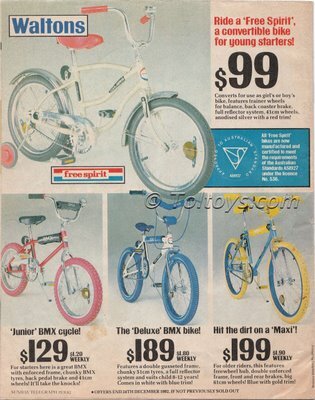 Many a young Aussie kid had there first BMX spills on one of these, I never knew where they were from before seeing them again in this catalogue. Whether you hit the dirt on the Free-Spirit Junior, Deluxe or Maxi you were out amongst it, almost as cool as those lucky little buggers on their Redline, Mongoose or PK Ripper. Admittedly they probably never had to deal with a mean kid who told them that their bike’s name sounded like an incontinence pad. If you’d like to check out more Aussie BMX culture than you can poke a stick at, head over to vintagebmx.com. The Australia thread in the International section is up to 18,000 posts, I kid you not.